The new command %send_tab% is to send TAB commands to the foreground program, so text forms can be filled better and faster. Info: In short, a tabular command is sent at the place of the placeholder %send_tab% to the active foreground program. Thus you can fill in several form fields at once with predefined text. This function is available from QuickTextPaste version 3.33! Info: The %send_enter% command is available from QuickTextPaste version 3.35! 1.) ... Working with the tab command and paste! 2.) ... does it work in Internet Explorer or Edge under Windows 10? 3.) ... from Version 3.85 %sleep_50% for send_tab send_enter! 1.) Working with the tab command and paste! I would like to explain the work with auto filling of form fields with some pictures and an effective example! Now for the explanation, %send_tab% causes QuickTextPaste to send the text in front of the placeholder via paste command to the foreground program via the clipboard. Then a tab command is sent (keyboard simulation), and so on until the complete text has been processed. The %send_tab% placeholder always ensures that QuickTextPaste sent after sending the text via paste command, send the TAB key command to the active window (keyboard simulation). The %send_enter% is the placeholder to send a enter (return) command to the to the active window (keyboard simulation). This allows you to fill form fields via QuickText Paste and the Windows clipboard. Automating can save you a lot of time. (Image-1) Ise this nice TAB automation function in Windows! 2.) does it work in Internet Explorer or Edge under Windows 10? It is independent of which program you use, so you can also use the Internet Explorer or MS Edge tab command. Whether it's Windows 10, Windows 7, 8, or 8.1, QuickTextPaste does not interest either. It is simply sends TAB and paste to the programs. And also for other versions of MS-Windows, it always works! Here are no limits to use this nice TAB automation function. 3.) from Version 3.85 %sleep_50% for send_tab send_enter! For very slow programs or computer, you can use %sleep_50% or %sleep_100% and %sleep_200% for 50, 100, 200 Milliseconds sleep. I have also improved the send tab and send enter feature. ►►►►► Plese use the latest version of QuickTextPaste! 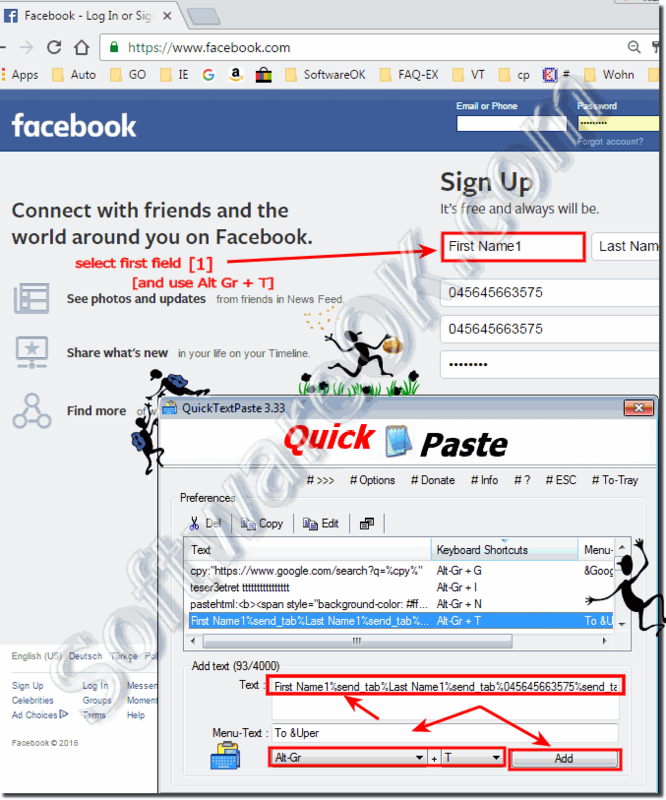 QuickTextPaste - FAQ-19: send_tab and send_enter command in Windows, how to? It's only an example, although addition of this delay option could be useful in a lot of other cases (such as executing commands in bash env, simply using hotkey).